Unspecified threat shuts down polling station in P.E.I. Two workers at a Moncton vape lounge are recovering from a frightening experience on the weekend. Kevin Moore and Darren McCormick say they were working at Jazz Vape & Hemp when two masked men entered the business. They say their vape lounge was mistakenly targeted for a cannabis dispensary. Moore says one suspect held them in a corner with a machete, while the other searched the building for cannabis. When they didn't find what they were looking for, McCormick says things turned violent. “As soon as he brought that machete up, that's when I grabbed the bat,” said McCormick. The pair say one of the suspects attempted to cut Moore in the neck, but McCormick intervened. “Moving the arm or changing the arm changed the angle of the attack, so it hit me on the side of the face, cleaned my face like a nice clean shave, travelled down my neck and onto my collarbone,” Moore said. They say the suspects also sprayed mace. McCormick took most of the rest of the mace straight to his eyes. “My sight was gone,” he said. When the RCMP arrived on scene, the suspects had already fled on foot and both employees were treated for their injuries by paramedics. Moore says he doesn't think he'd still be alive if it wasn't for his friend. “He saved my life without even thinking of peril to himself,” Moore said. The men say it was a close call and a night they won't forget. “Someone that would attack someone without provocation, with an edged weapon like that? 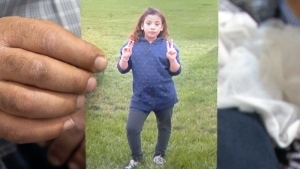 They shouldn’t be loose in our society,” said McCormick. With files from CTV Atlantic’s Kate Walker. Kevin Moore and Darren McCormick were both working at Jazz Vape & Hemp when two masked men entered the Moncton business. They say their vape lounge was mistakenly targeted for a cannabis dispensary. Bomb threat at polling location prompts pause in voting: Elections P.E.I. 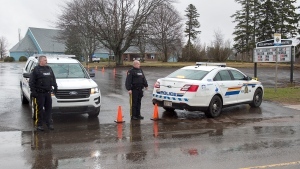 Voting at polling station in central Prince Edward Island was temporarily suspended Tuesday as police investigated a bomb threat as the provincial election drew to a close.